20 Buck Spin is proud to announce the signing of American metal outfit, OBSEQUIAE. Hailing from the great Northern end of Minnesota, the band creates a unique, organic blend of dark, melodic black and death metal infused with traditional medieval music. 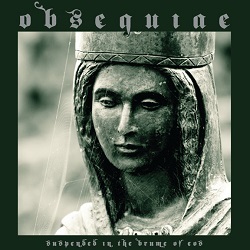 OBSEQUIAE‘s debut album, Suspended In The Brume Of Eos, was released on CD via Bindrune Recordings in 2011. Having remained an in-house favorite since its initial release, 20 Buck Spin is proud to confirm the upcoming release of Suspended In The Brume Of Eos on vinyl for the first time on May 27th. Repackaged with new artwork the new vinyl edition will act as a reintroduction of OBSEQUIAE in advance of the band’s anticipated second LP, which will surface on 20 Buck Spin later in 2014. Preorders for the vinyl edition of In The Brume Of Eos will be available in the near future, and new stateside live performances are being scheduled in the second half of the year.